A court in Ivory Coast has ruled that $45m (£28m) due to 30,000 alleged victims of dumped waste should be distributed by a local activist. Claimants' lawyers expressed doubts about whether the activist, Claude Gohourou, would pass on the money. One lawyer said only his firm knew the identity of the claimants, and that he was worried false lists would be made. Mr Gohourou's association said fraud was more likely if the lawyers handled the money. 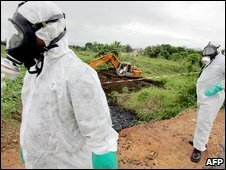 The case concerns 500 tonnes of chemical waste brought to Ivory Coast by multi-national oil company Trafigura and dumped around Abidjan by a local contractor in 2006. Trafigura agreed last year to pay people who said they had been made ill by the waste. The company and the claimants' lawyers agreed that a link between the dumped waste and deaths had not been proved. The BBC's John James in Abidjan says supporters of Mr Gohourou cheered as Friday's ruling was read out. It overturns an earlier ruling that Mr Gohourou should not distribute the payments, and claimants' lawyers said they would appeal. Martyn Day, a senior partner at Leigh Day, the British law firm that has been representing claimants, said that following Friday's ruling, "the prospect of our clients receiving their compensation look somewhat remote". "In 30 years of practice I cannot remember a more depressing court decision," he said. "Thirty thousand Ivoirians have been looking to get the compensation due to them to alleviate their lives. Now there is a very real chance they will not see a penny." Another Leigh Day lawyer, Kouame Klement, said only his firm knew the identity of those due to be paid, and that he was worried Mr Gohourou's group would create fictional lists of names. Leigh Day said in a statement that it was concerned there was a "Mr Big" behind Mr Gohourou, one of about 50 representatives of communities who say they were affected by the dumped waste. It said it had worked out a system for claimants to withdraw payments at bank machines and had given out personal identification numbers (PINs) in October when the bank was issued with a freezing order obtained by Mr Gouhourou. Amnesty International is among those concerned that the money could be stolen if passed to Mr Gohourou's newly created non-governmental organisation. A member of Mr Gohourou's association claimed that a list of more than 20,000 claimants who signed a petition saying they wanted the British lawyers to be in charge of distributing the money was false. He said there was more chance of fraud if Leigh Day distributed the money. However, our correspondent says that when asked who they wanted to distribute the money, claimants gathered at the court for Friday's verdict said, "the English" - a reference to Leigh Day. The 30,000 people due to receive payments say they were made ill by the chemical waste. Trafigura has always denied that the waste was dangerous or that it knew the waste would be dumped.